That’s what’s for dinner around here. 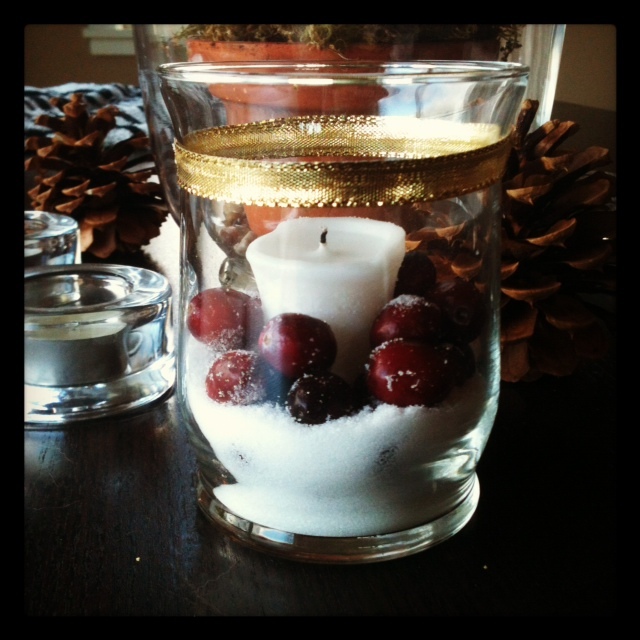 You should head over to A Collection of Passions to check out my friend Kacie’s monthly (!) meal planning posts… so inspiring. We have been in our sweet little home for four years now, and have finished most of the big projects that needed to be tackled upon moving in. We currently find ourselves in a phase where we can conquer the “fun stuff'”. 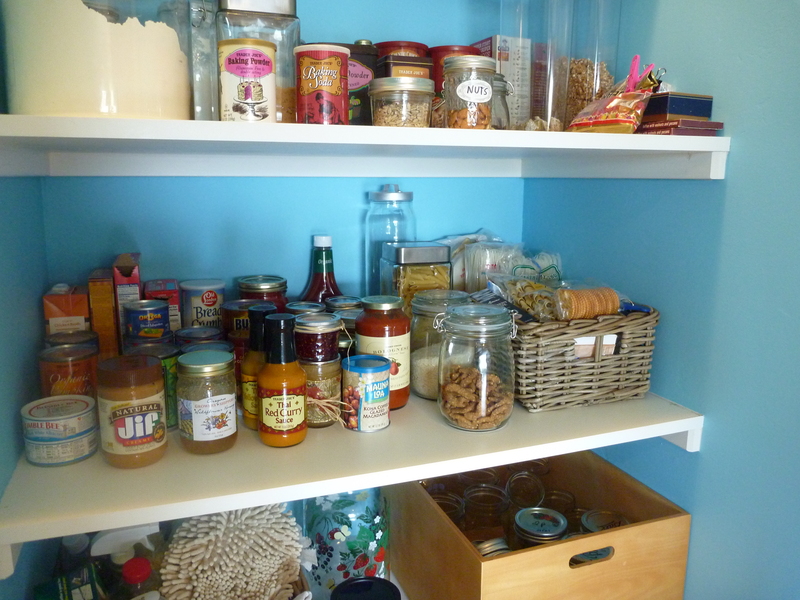 The state of my pantry has been bothering me for a while, and I’m slightly annoyed with myself for not having any decent before photos to adequately illustrate its formerly pitiful state. 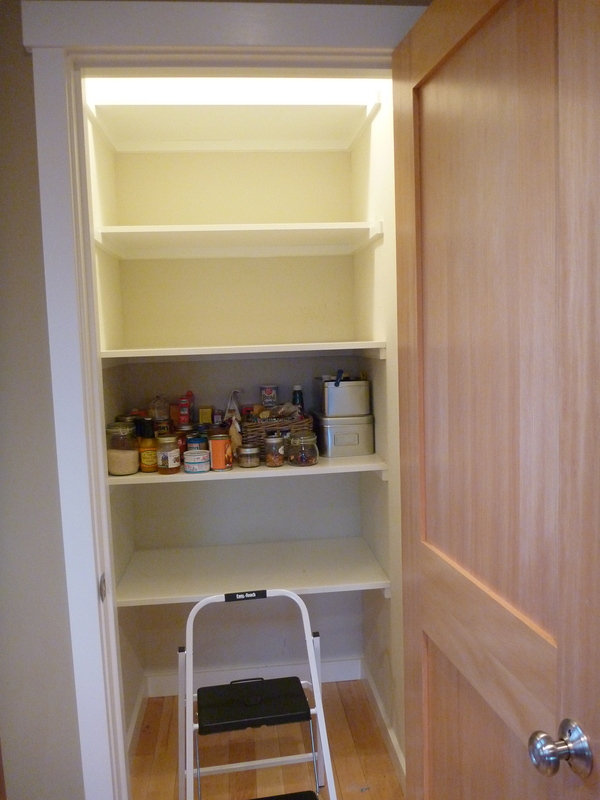 I’ve been chipping away at the reorg, and between Pinterest and great blog resources, I now love my pantry so much that I want to take the door off the hinges. 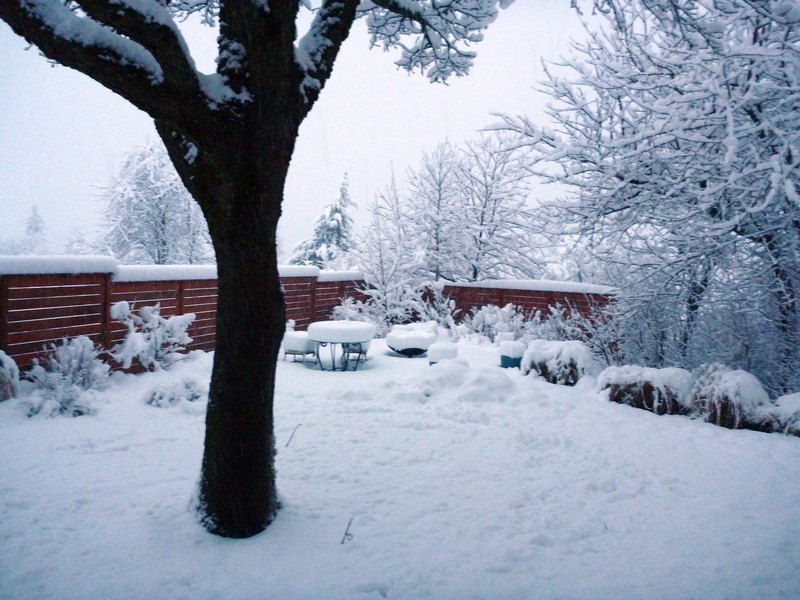 Here’s the best that I can offer for a BEFORE photo…(sadly, I had already removed most items before I thought about taking a picture). I should probably explain that the colors in our house are mostly neutral. 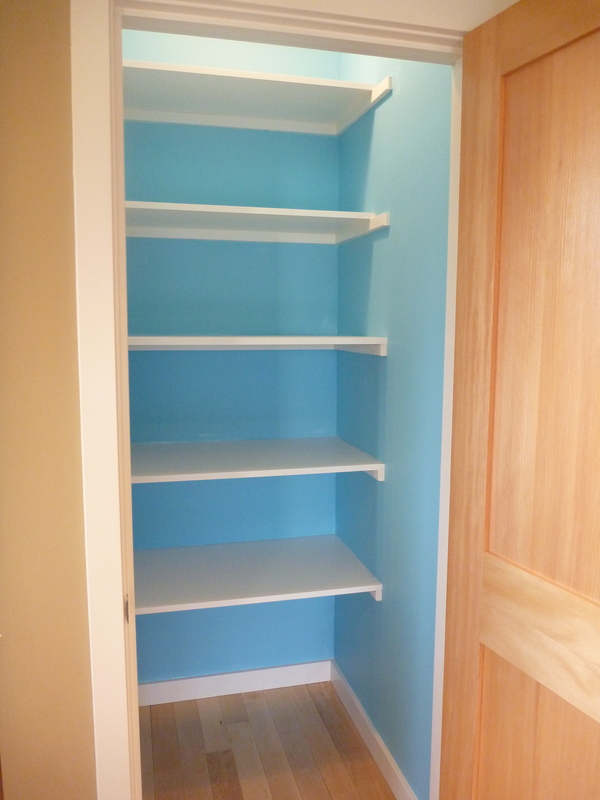 I’ve been itching for some bright colors, and thought it would be a fun little trick-or-treat to paint the inside of the pantry in an eye popping blue. I loooooove how it turned out. Purge. 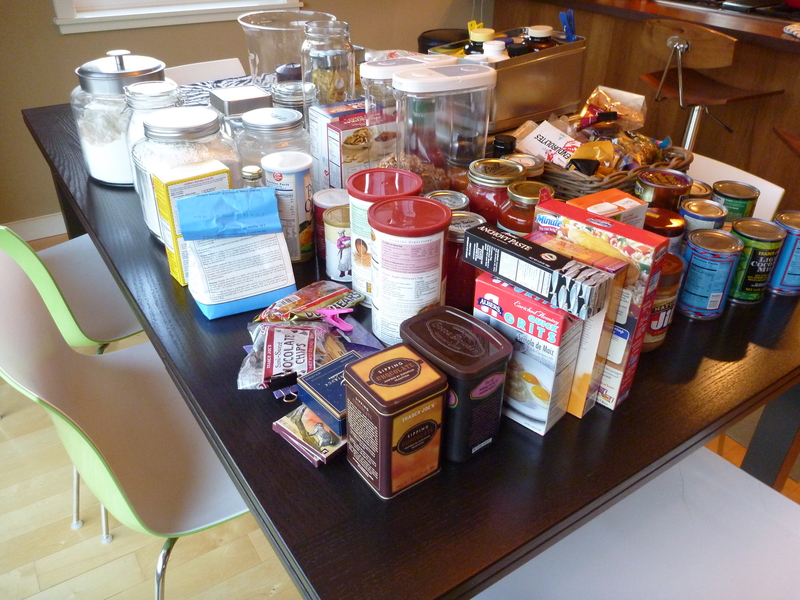 I removed everything from the pantry and placed all the food items on our dining room table. I put it where I could really see what I was dealing with. I went through and tossed out unwanted items (WHY did I have a can of fruit cocktail in my pantry? WHY?! I can’t even remember buying it…or WHY) and anything that was past expiration. Declutter. 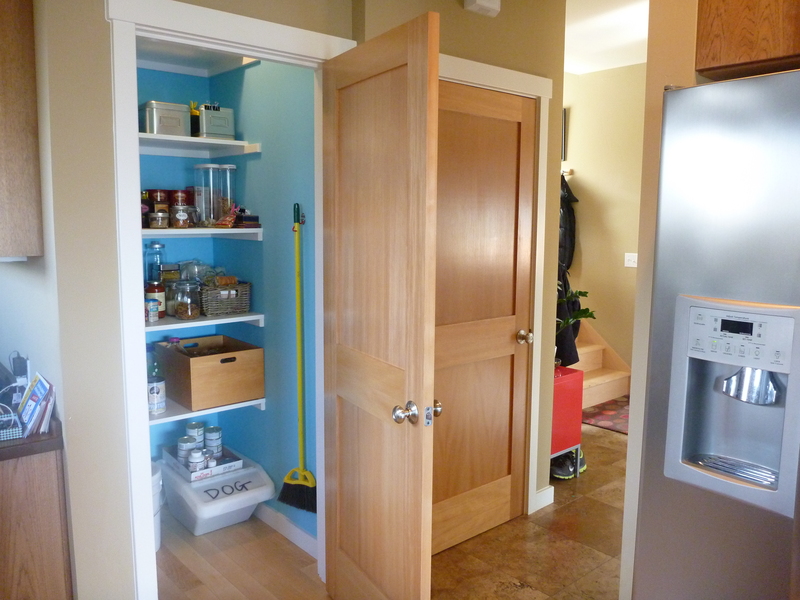 We installed two hooks to get the mop/broom up off the floor, and removed anything else that had no business being in the pantry. Beautify. I scrubbed the shelves and wood floor. Then I taped all the edges and painted the walls in Fairy Tale Blue by Benjamin Moore (our main home color is Lenox Tan, for reference). It may sound crazy to take the time to paint what is essentially a closet….but it makes me so happy when I peek inside now. Containers. Get rid of awkward bags of rice, flour, sugar, etc. and replace with containers that keep things neat and clean. 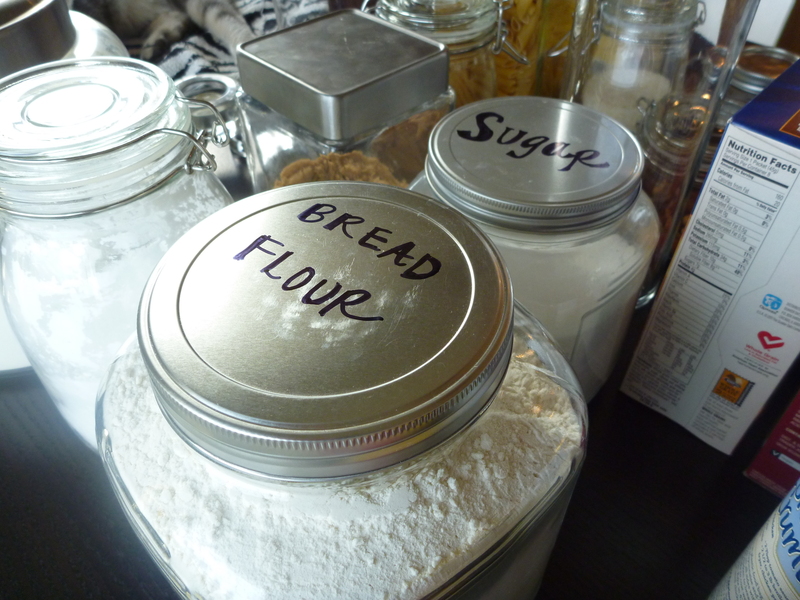 Label anything that could get mixed up (bread flour vs all-purpose flour, for example). IKEA and Target are great resources for bigger containers. 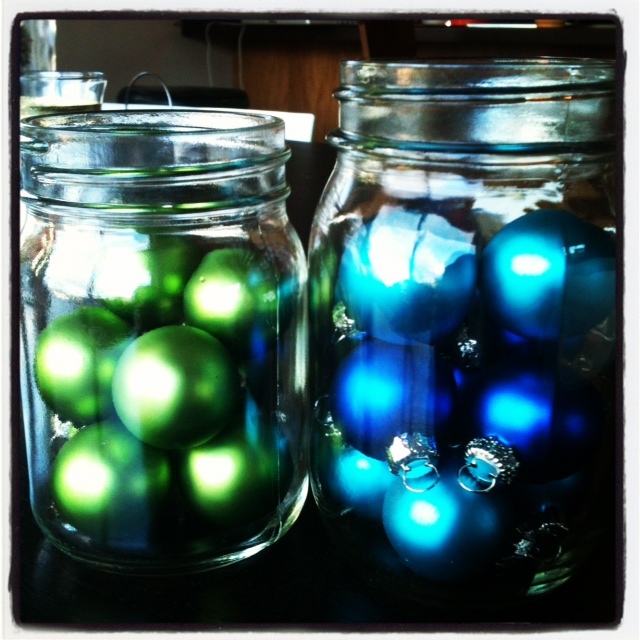 I love using mason jars and repurposing old jam and spaghetti sauce jars for smaller storage. After being inspired by this zero-waste kitchen, I am trying to buy more things in bulk (added bonus: I save some moolah). Divide. Organize food into “zones”. I kept all of my baking things on one shelf and put all my canned food, etc. on a different shelf. I also kept my international ingredients grouped together. Accessibility. Keep the items that you use most frequently within easy reach. My canning gadgets, for example, went to the very top shelf as I only access them during the summer. Also, think about who uses your pantry–if you have little ones, you may want to store their snacks within their reach (or…not). Reassess often. I always laugh when magazines offer their tips for “must have pantry items”. Your kitchen should reflect your cooking style. If you use it a lot, keep it stocked. I am not a big hoarder, so I only stock items that I burn through quickly. I like to freeze things like chicken broth and tomato paste when I don’t use the entire package, so between my freezer and my pantry, things are fairly minimal. Love your home. If there is a space that is bothering you, honor it, and make changes. You’ll wonder why you waited so long…. …and they are were amazing. 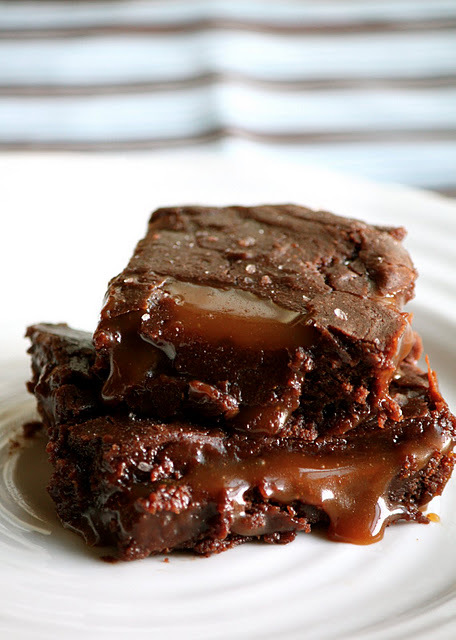 The brownie recipe can be found HERE. Next week I’ll share my recipe for the second best thing you’ll ever put in your mouth: Sweet & Spicy Roasted Nuts (because who doesn’t love warm nuts?!) Stay tuned! Some of you have inquired about a few of this year’s Christmas decorations. While I’ve been utterly consumed by the new course that I’m currently teaching, I did eek out time for some fun Christmas projects. Thank you Pinterest!!! The subway art came from the Mod Podge blog, you can download the free print HERE. We had ours mounted on foam core, which kept the cost down and makes for versatile placement. While I kept most things simple, I did spend a lot of time on my balls. Felted balls, that is. 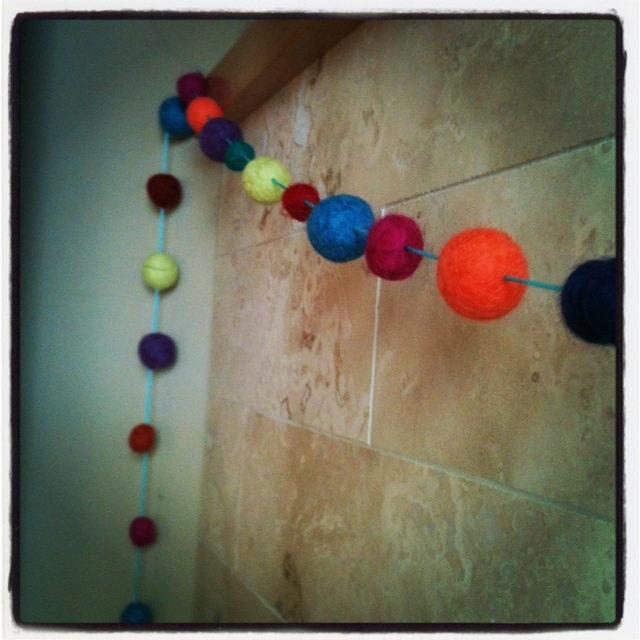 Following this tutorial from the Pickles blog, I hand felted 45 colorful balls from roving wool. This video is also very helpful. 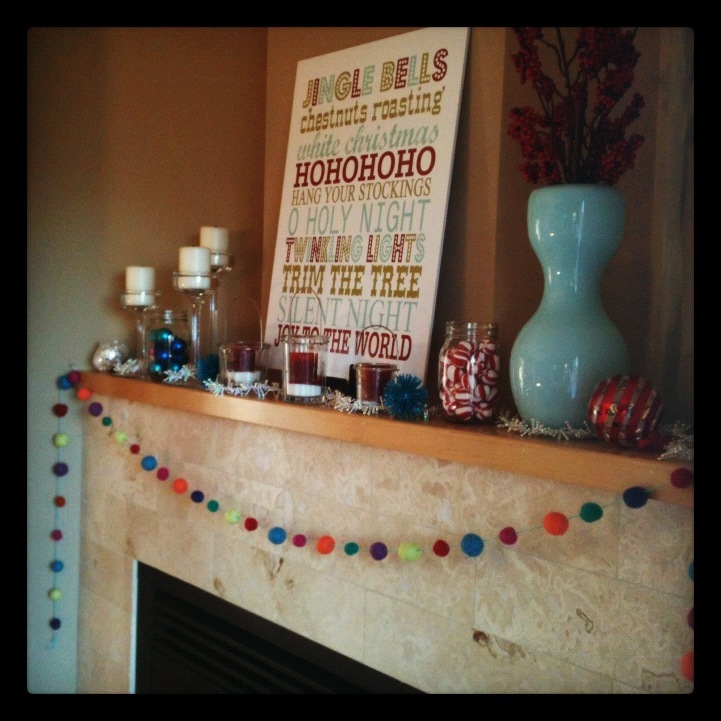 My garland is about eight feet long, with two inches of space between each felt ball. I struggled with whether or not I should glue or knot them into place, but ultimately I did not. I’m glad that I didn’t as the felt is “grabby” and they don’t move once you have them in place. Here’s a close-up shot of my balls. I heart them. I found the bright colors at my favorite shop, Knot Another Hat, in Hood River. We also visited these guys from Foothills Yarn & Fiber, near Odell. 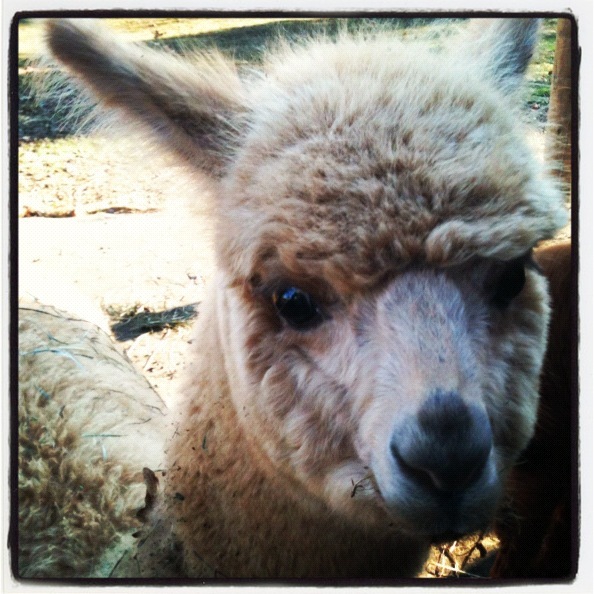 I now want my very own alpaca for Christmas. I’ve managed to keep everything else cheap & easy, just how I like it. 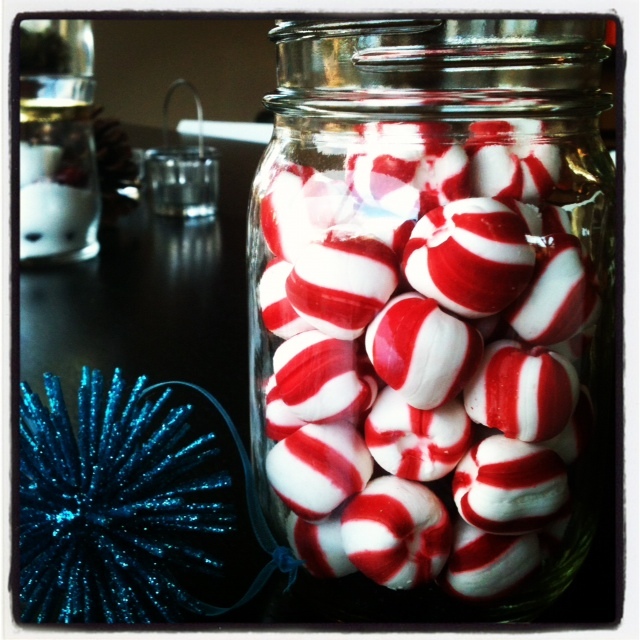 I love to display my cards every year, and found this peppermint striped ribbon in the half-off bin at Michael’s. 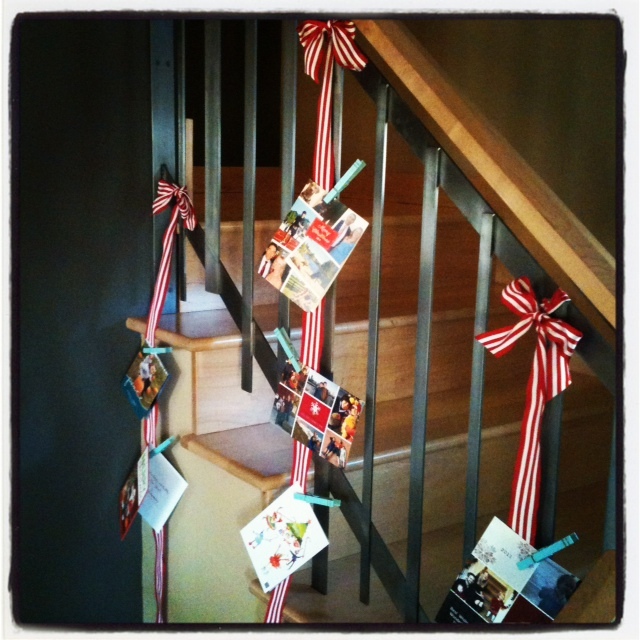 Using Krylon’s “Blue Ocean Breeze”, I spray painted clothespins to hang the cards with. Because it’s almost Thanksgiving (what?!) and because I’m good at sharing….I thought I would pass this little gem along. 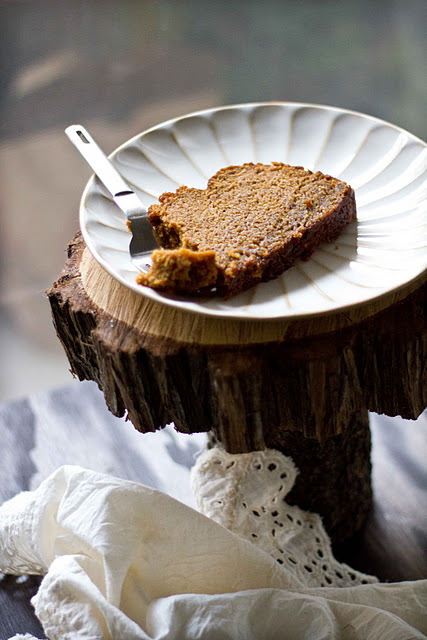 The fabulous Eva, over at Adventures in Cooking, posted this recipe back in September. I have proceeded to bake (and consume) this bread more times than I can even count. The only variation that I make is adding a dash of nutmeg. Do not skimp on the buttermilk, as it gives the bread perfect texture (I ran out of buttermilk once, and substituted yogurt in my panicked state, which turned out fine– but I prefer the buttermilk version). 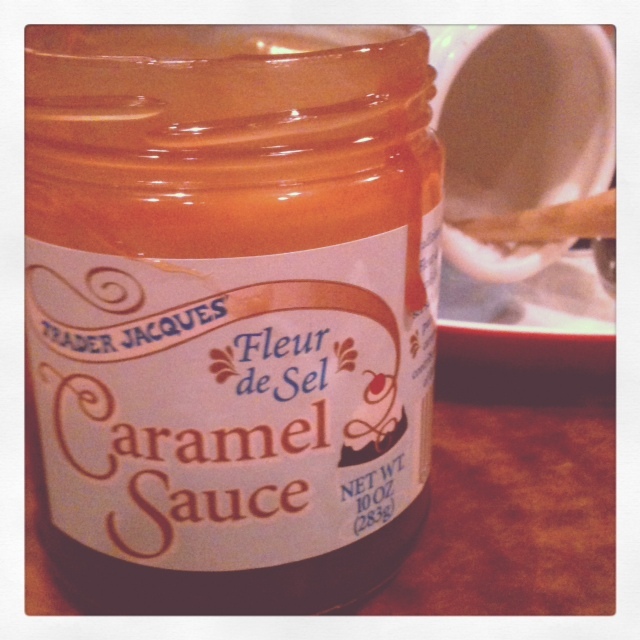 You could even spread on a bit of caramel cream cheese frosting to really sweeten it up. But then again, it is just fine on its own. Enjoy! Firstly, if you haven’t discovered Trader Joe’s Curry Sauces, you’re in for a treat (if you don’t live near a Trader Joe’s, I’m really REALLY sorry). It’s the easiest weeknight meal ever, which I will get to below. Secondly, as the weather has turned, I have busted out my America’s Test Kitchen, Slow Cooker Revolution book. No, I’m not endorsed by them (I WISH), but it is my go-to during the winter months when I am working, so grab yourself a copy if you want to follow along (sidebar: No, you do not have to follow every complicated step offered in the book, just use it as a guide, people!). Here’s my plan for this week (11/7-11/11), feel free to follow along or steal whatever works for you, again, this is mostly a way to keep myself accountable (and to avoid ordering take-out Thai food every single night of the week). MONDAY: Pad See Ew (recipe HERE. I buy most of my ingredients at the Lily Market in Portland). THURSDAY: Tuna Melts & Tomato Bisque (TJ’s stopped carrying my go-to bisque…sigh….I will be canning THIS soon). FRIDAY: Off to Bend to celebrate our friend’s wedding. Congrats Jeff & Tina!!!! Directions: Empty jar of curry sauce into the slow cooker, with potatoes and carrots. Add frozen chicken breasts, turning over once or twice to coat in the sauce. Cook on low for up to 8 hours (ideally, you would cook them for 4-6 hours, but who works for 4 hours?! If you DO cook them for a shorter period, nuke the potatoes in the microwave for a couple minutes before adding to cooker, as they will still be tough after only 4 hours). When chicken is done, cut into bite sized pieces, stir in peas, and let them warm through. Serve over rice with your choice of garnish. 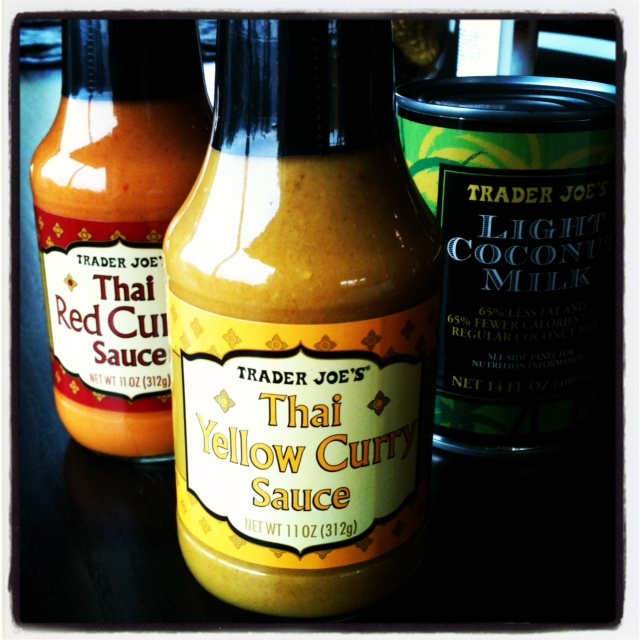 **If you find that you are short on sauce or that it is too spicy, cut it with a little coconut milk or chicken broth. garnish with chopped bananas, brown sugar, milk, etc. Bring 4 cups of water and one teaspoon of vanilla to a boil. In a small bowl, mix together steel cut oats, coconut flakes, cinnamon, nutmeg, and sea salt. Add dry mixture to boiling water and let simmer, uncovered, for about 30 minutes, until all liquid is absorbed. 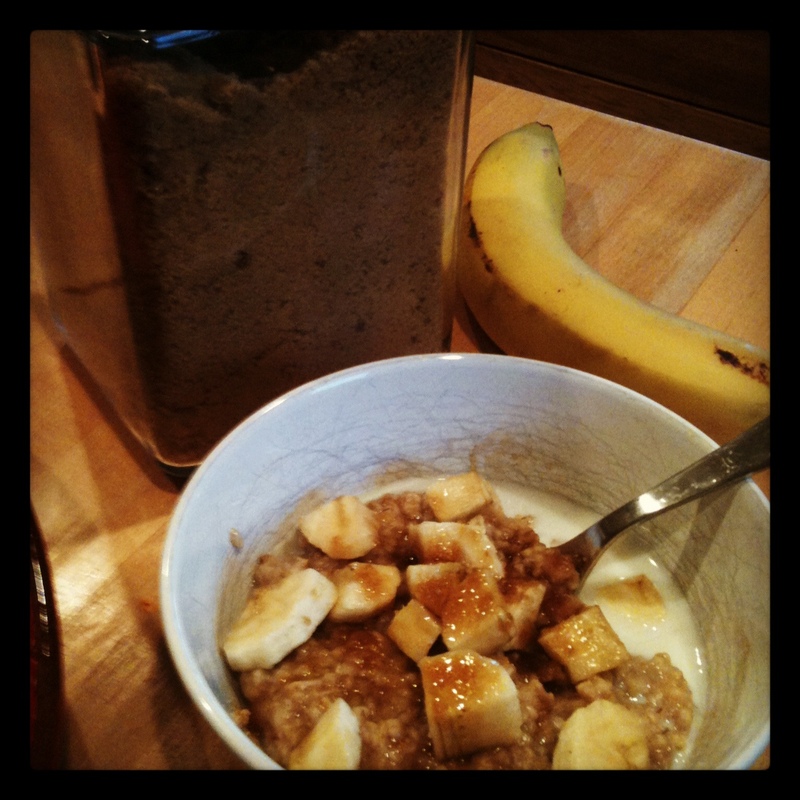 Top with your choice of chopped bananas, brown sugar, dash of milk, and/or slivered almonds. Happy fall!